In the doldrums of winter – and with little snow for cross-country skiing, snowshoeing or fat biking – a new event has been established to keep bikers fit and competitive throughout the next few months. INDOOR ACTIVE will host an indoor cycling race series at the Kress Pavilion in Egg Harbor. Although the series of four races employs some advanced technology – CycleOps M2 Smart Trainers with resistance synced to PerfPRO Studio course-route data – Stollenwerk encourages riders of all abilities to participate. All you need is a bike. Although bikers of different abilities would quickly spread out on a road outside, this event sustains the spirit of competition cycling in a group setting throughout the race time. Each rider will compete on his or her own bike, set up on a trainer and synced to the same 10K course. (A bike can be provided if you don’t have your own.) Because the course sometimes simulates an incline, resistance on the trainer will automatically increase as if riding outside. The fastest male and female riders at each indoor race will earn awards. Those who participate in all four races will also be eligible to earn an award for the fastest overall time. Stollenwerk, who owns Edge of Park Bike & Moped Rental and operates it during the summer, has met a cohort of cyclists who didn’t want to hang up their race wheels for six months each year. Four times a week, Stollenwerk hosts cycling workouts at Edge of Park in Fish Creek using the same setup. 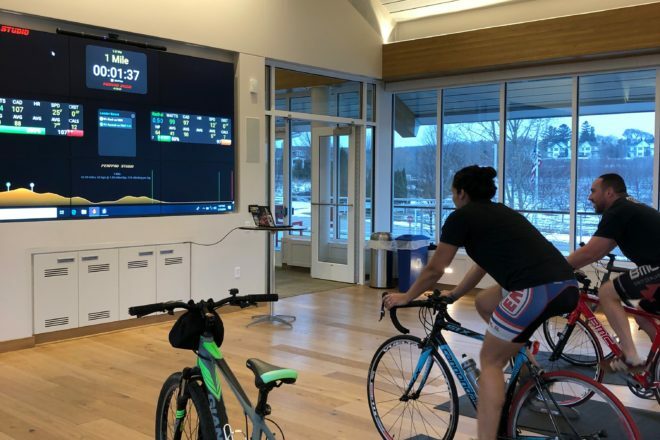 The consistent rider can watch his or her absolute power, speed and time improve by using true data, rather than an uncalibrated resistance lever found on the bikes at most spin classes. The first race at the Kress Pavilion will be held Jan. 20, and registration will remain open until the start of the event. The other races will be held Feb. 24, March 17 and April 20, all featuring different courses. Registration is $20 for one race or $75 for the series. Register at indooractivesports.com/winter-race-series.